Did you know that Umbrellas.com can custom print umbrellas for you? Yep! All you have to do is visit our sister site GolfUmbrellas.com and start shopping! They are associated directly with us and rest assured that every order that you place, umbrellas.com will see right away. We can custom print just about anything that you want. A simple logo maybe? or how about a congratulatory message for a special event? How cool would it be to see everyone at your wedding with a custom printed umbrella marking the date and place of where your vows were said, or seeing everyone at a company event with an umbrella that has your unique logo on it?! We also have a huge selection of umbrellas that you can choose from to custom print on. Let's start with the mini umbrella. These could be great for promotional events such as announcing a new line of cars, or at a car show where there are a lot of vendors and people (such as Lexus). These mini umbrellas are also perfect for school, hospital, and even bank events. Next let's move onto an umbrella that is a little bigger, such as the Golf Umbrella. 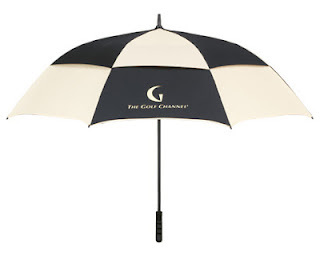 As the name implies, these umbrellas are perfect for golf outings. Whether it be sunshine or a full on downpour, these umbrellas will keep you nice and dry while proudly displaying your logo or message. 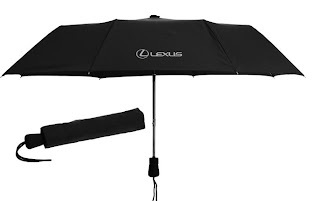 Our Golf Umbrella pictured, is extremely sturdy and vented to prevent it flipping inside out. It can even withstand wind gusts up to 70 mph! 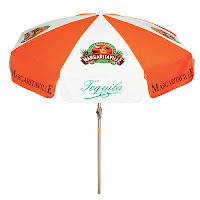 Custom printed umbrellas are especially useful for restaurants, cafe's and businesses. Think of them as eye-level billboards. Picture walking out the back of your restaurant and seeing all your tables with patio umbrellas with your restaurants colors, name and logo on them. They wont only pull the inside and outside together cohesively, but they'll be a stylish accessory to any outdoor space! We also sell Canopy/Tent Umbrellas that come in a variety of different sizes. 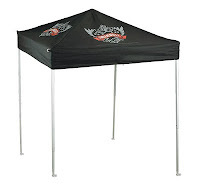 They are quite sturdy and are great for outdoor events that feature different vendors. Stand out from your competition and get your company's name and logo printed on the Tent Umbrella so that people can see you from miles away.